I'm Here. I'm Queer. What the Hell do I read? : The SCBWI 2010 Summer Conference: Day Four!!!! Breathe deep. Pace Yourself. So. Much. Good. Stuff. Still. To. Come! We get a publisher's panel, with Justin Chanda, Jennifer Hunt (there's a great pre-conference interview with Jennifer by SCBWI Team Blog captain Alice Pope here), Stephanie Lurie and Francesco Sedita (also interviewed by Alice here), the final morning and afternoon workshops, and Ashely Bryan's closing Keynote. 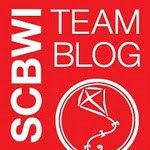 Thanks for coming along on this adventure with me and the rest of SCBWI Team Blog!